We provide babysitting services for all special events and parties such as weddings, quinceaneras, conferences/conventions, rehearsal dinners, holiday parties, reunions, birthday parties, Bat/Bar Mitsvahs, and many more. We understand that every event is unique, so our packages are customizable and we quote based on the number of children and the hours of service. Ideal for the individual parent/family who simply needs a sitter who can watch their child/children for a few hours while they attend an "adult only" event. We will travel to the event venue or a location close by so that you can enjoy your evening while knowing your kids are in good hands. Goodie Bags available upon request for an additional charge. (Most Popular) Perfect for the couple or family looking for hands-on, engaging babysitting service for more than 3 kids. 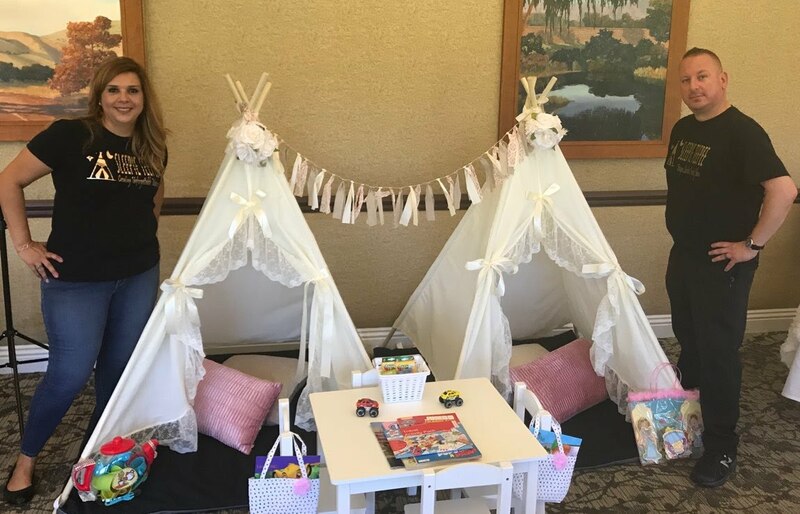 We will travel to any event venue and set up our Kiddie Table so that the adults at your wedding, party, or special event can enjoy the evening. We will keep the kids entertained with a variety of age appropriate entertainment such as Playdoh, board games, coloring books, watercolors, stencils, building blocks, card making kits and much more! //We will also supervise meals provided by parents or venue. For extra fun, customize to include one of the Add On Services from our list below! This package is ideal for larger events such as corporate meetings, fairs, kids' birthday parties and conferences. 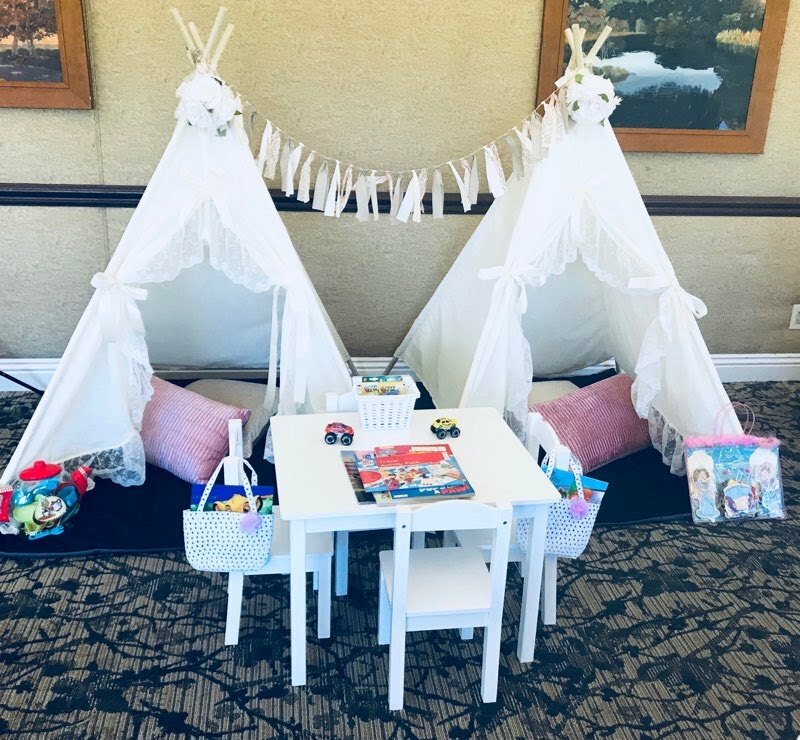 It includes 3 sitters and an interactive activity corner with up to 4 creative activity stations. PAYMENT MUST BE PAID IN FULL AT LEAST 72 HOURS BEFORE EVENT. SPECIAL ADD ON FACE PAINTING by Vienna. Contact us for pricing. 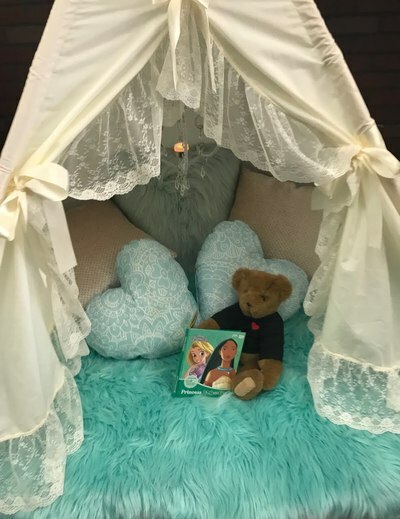 SPECIAL ADD ON SLEEPIE TEEPEE, LLC. Creating unforgettable memories one teepee at a time. Perfect for outdoor events, birthday parties, family reunions and more! Contact us for pricing. SPECIAL ADD ON MESH KIDS CO. Soft Sensory Play Spaces for babies and tots 0-5 years old. Perfect for events of all sorts such as picnics, family reunions, birthday parties, weddings and more! Contact us for pricing.